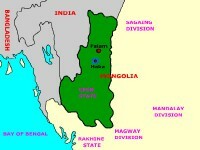 Yangon Chin is a somewhat inaccessible state occupied largely by ethnic Chin’s along the western and northern mountainous areas of Myanmar strategically located along the Indian and Chinese borders of the country. The state is geographically large, but its population is hardly 500,000, and perhaps significantly less given the number of Chin who have fled, largely because of religious oppression that has enjoyed government support and military implementation for years, as we learned in a lengthy meeting with the Chin Human Rights Organization. With all the current news coverage about the ethnic violence involving Muslims in some of the rural areas, the religious oppression here involves Christians, and more precisely, Baptists. It seems that in the 1880’s, Baptists missionaries from the United States, began proselytizing among the Chin and somehow caught lightning in a bottle because of the alignment of animism and Christianity in a weird synergy. Unfortunately, the military government has tended to build unity in this overwhelmingly Buddhist country by equating religion and nationalism. We heard of a program of residential schools that seemed similar to the colonization of first Canadians and Native Americans in North America with the added incentives of promises of scholarships and jobs. They shared a recent report entitled, “Threats to Our Existence” that detailed instances of forced labor used to build pagodas by Christians so that higher officials could win “merit” as well as sites where there were cross destructions. Normally, the CHRO is left “documenting” these cases for the various United Nations bodies responsible for either refugees or human rights abuses, but now they were helping to prepare for a coming meeting in Chin State won as part of the ceasefire settlement that would organize a human rights commission, so they were more hopeful of real action. 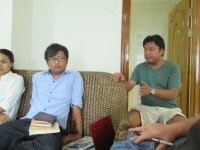 Later in our day we met with a representative of the Burma News International named Khin Maung Shwe. 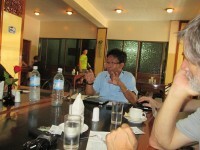 As deeply rooted and methodical as CHRO was in its approach, BNI was all up in the air with plans and dreams. They were an on-line news source, but also publishing two books on the political peace process and the economy, as well as trying to figure out how to build a national FM radio network with a host of foreign donors from George Soros’ Open Society to French media foundations. Where days ago one of our group had asked about social networking and almost gotten a blank stare, BNI was deeply ambitious and uploading news to Facebook at one time, Twitter later in the day, and then finally on their website. 30 people were employed by the project and they were moving like a house on fire. Did they have problems with censorship? Sure, but this was their time! How about the government? 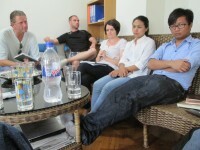 Well, they met with them monthly along with others and were hoping to convince them to license their efforts. Jay Hessey formerly of SEIU and now working in Mae Sot, Thailand with refugees, commented later that one thing that was most moving was the amount of hope everyone seemed to have. His observation was inarguable, not withstanding any facts to the contrary. Lafayette The notion that whole governments including ostensibly liberal democracies like the United Kingdom would simply throw all pretense about freedom of speech out the window when it comes to social networking tools like Facebook, Twitter, and various instant messaging services proves that all of the freedoms we take for granted are just that, taken for granted and as fragile as an egg shell. Police and government officials in the UK asked Twitter if they could eliminate this nuisance of using Twitter names that were not real name, so that it would be easier for them to bust people Twitter luckily in this case demurred. The Blackberry people with Research in Motion in Waterloo, Canada seemed from these reports to be read to fold as easily as a cheap suit to virtually any government request, which was disconcerting since so many of us are (were?) hanging on as Blackberry users and fans. Luckily, I don’t use whatever Blackberry Messenger is, but I found myself reaching out to colleagues in Toronto with ACORN Canada pretty damned quickly after reading about their weak knees to make sure that was the case. The Iranian government is having a bit of fun with this and offered to send a human rights delegation to London to investigate abuses, since the UK had offered to do much the same when they shut down Twitter and Facebook during protests a couple of years ago. Ha-ha-not! In San Francisco reputedly a bastion of both freedom and certainly speech, the BART rapid transit system has been stubbornly defending their willingness to cut off all access to the internet to block protests. There are now reports on stalking based on pejorative tweets within the Buddhist community in the USA. Do we really want this? I don’t think so, and I say this as someone who has gotten a good share of flaming, threatening, and violently abusive messages over the internet transom at different times. I worry less about those crazies than the ones hiding behind doors, if you know what I mean. As long as there is a Delete button, I’m able to weather all of those storms with“sticks and stones” vigilance while letting the “words” roll off, like water off a duck’s back. We have to have the ability to organize and associate, even when others go over the line. It’s easier to say we’re sorry in such circumstances, than to imagine the lack of freedom involved in having to ask permission to be able to speak to ourselves much less our governments about our interests and issues.